Happy Weekend Everyone!! What a great start to an awesome weekend I am having. Tomorrow we are celebrating my sons first birthday. I have had a blast preparing for his big day. Hopefully I will be able to share pictures sometime this week. I think I have picked a great theme. We decided to have the party at our home thinking it was going to save us some money. Well... it has not saved us that much money. Decorations and food has been up there in price. Right now I am praying that there is no rain or thunderstorms. I have had to change my plans around just a bit. I was planning on having everything outside in the backyard that I love. Since the forecast is calling for 50% chance of thunderstorms I am going to have to place a small canopy tent up on the deck and have all the food set up in the kitchen. Hopefully everything will go smooth and there will be no rain. Come on hopefully Mother Nature will have a heart. You only have one first birthday. 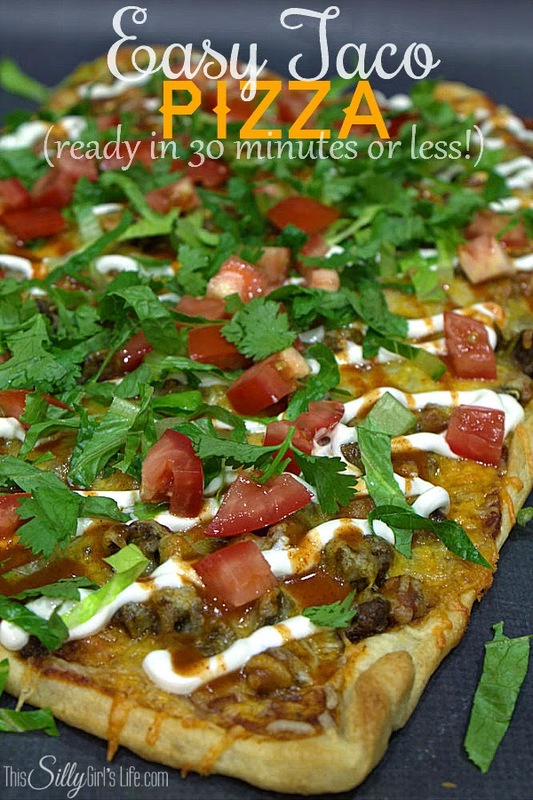 I loved her recipe on the Easy Taco Pizza. Every time my husband and I go thru the drive thru at Taco Bell we always say we need to learn to make their mexican pizza. So I am eager to try out her recipe.